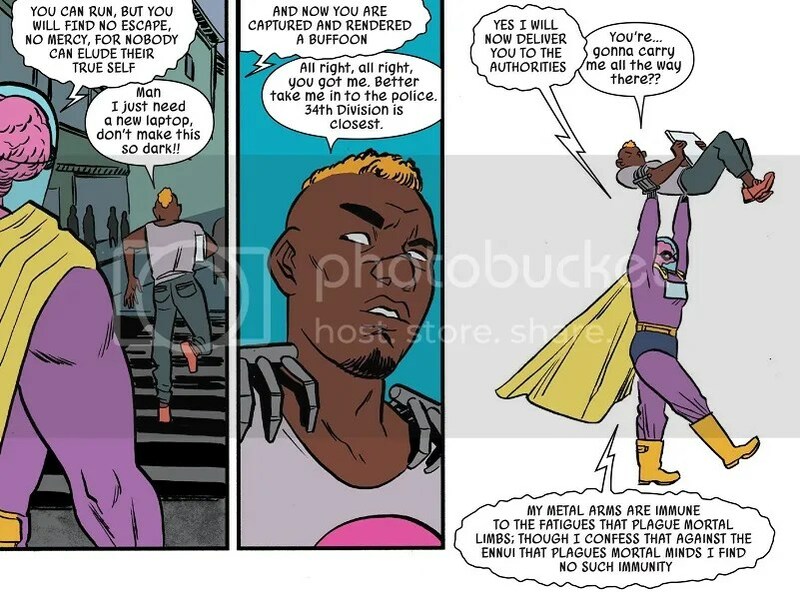 I have really enjoyed the new Batgirl volume, which continues the fun of Batgirl of Burnside (for the most part), while introducing our hero to some new locales. This new issue, though, slows things down a bit too much for my tastes. Barbara Gordon gets the stuffing beaten out of her in an MMA match, but she recognized the tattoo on the arm of her opponent as being that of her costumed adversary. So she rushes home and, sure enough, finds the costumed baddie — Moth — attacking Kai! Now that she knows the woman’s tricks, Batgirl beats her in the fight and sends her packing. But when she confronts Kai as Barbara, he refuses to reveal what he’s cooked up in, so Babs leaves him and books a flight to South Korea. One encounter with a pushy salesman later and Babs realizes that maybe this whole thing involves some fancy smuggled bacteria. She follows a tracker she took off Moth and winds up at the top of a big skyscraper in Seoul — where she’s promptly ambushed by Moth and another bad guy. This was a fine issue, and it moves everything forward a bit, but it seemed to lack that special charm I’ve been enjoying in previous issues. I can’t quite put my finger on what went wrong, though. Scenes kind of cut to the next one pretty rapidly. Nothing of too much note actually happened. The villain is vaguely defined. Like, I’m not sure if Batgirl has been fighting the same person in every issue, or if there’s a league of martial arts villains who all have the same tattoo. It’s not that big of a deal, I suppose. 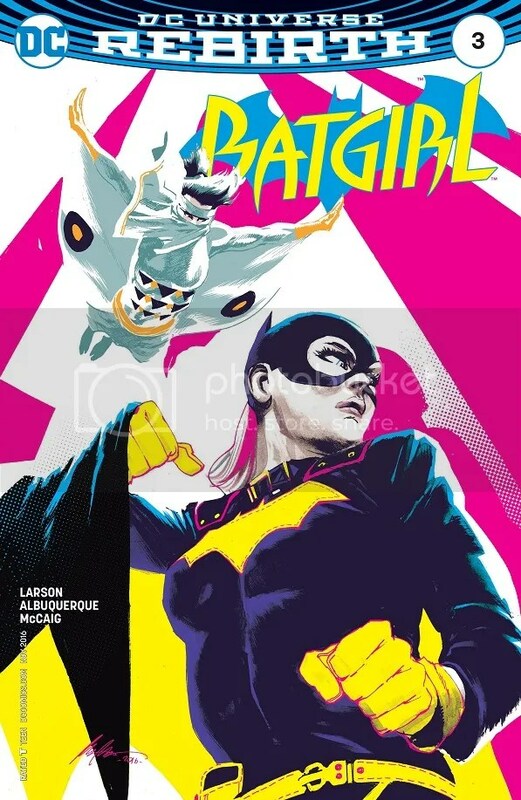 This was a perfectly fine issue of the new Batgirl, but it’s in the middle of a story and has a lot of moving pieces that could stand to be a little more clearly defined. I have put it on the record that I am totally on board for whatever Spencer and Marvel have planned for their evil Captain America. Bring it on. I want to read this story. But five issues in and I’m a little worried that Spencer doesn’t actually have a story to tell. In this issue, Spencer lays out what Captain America has been up to in the margins of Civil War II. We see a few key scenes from Rogers’ perspective, and how he tried to assassinate Ulysses and how he anonymously played a hand in having everyone turn on Bruce Banner. Because he works for HYDRA now, Cap is able to discover that at least one of Ulysses’ visions involving HYDRA is wrong, but he can’t tell any of his superhero friends. The Red Skull tells Cap to bring Ulysses to him alive. But then Cap and everyone else bare witness to Ulysses’ latest vision: that Cap will be murdered by Miles Morales on the steps of the U.S. Capital. Meanwhile, we continue to see flashbacks of the mysterious HYDRA woman in red and how she shaped young Steve Rogers into the double agent we know in the present. It basically amounts to having his parents killed and then just taking him to a HYDRA facility. Most of this new Steve Rogers series has been about setting up and then explaining the twist that he now works as a HYDRA double agent. And I thought, after last issue, that we’d finally pick up with whatever story Spencer plans to tell about him now. But this issue is still more set-up. What has an evil Captain America been doing during Civil War II? Kind of just hanging out in the shadows observing and occasionally getting his feet wet in small ways that don’t really change what we know about Civil War II. There’s no real story to this issue, it’s just a few vignettes of evil Steve and his partner, Dr. Selvig, reacting to the events of Civil War II. I suppose that works for a tie-in, but I want to see Spencer really sink his teeth into whatever he has planned. Spencer and Marvel have gone to great lengths to set up an evil Steve Rogers, and while I love the idea and can’t see what happens with it, this issue continues to just spin its wheels without going anywhere. Story has taken a back seat to exposition and explanation. This somewhat confusing chapter of Ms. Marvel has finally come to a close, and not a moment too soon. I still don’t fully understand what Wilson was doing in this storyline, but at least Kamala herself remained a solid focal point for all this Civil War II madness. With the help of Hijinx and his Canadian ninjas, Ms. Marvel stages a fake bombing to draw out Basic Becky and the Cadets. 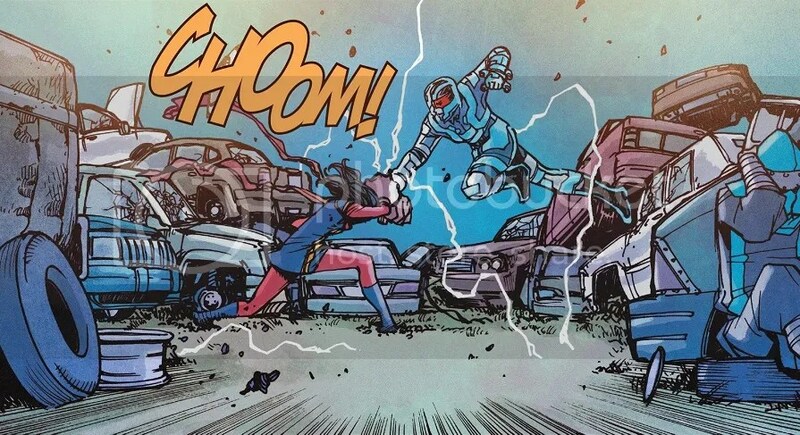 The fight is pretty epic, until Kamala hits her special signal watch and Captain Marvel shows up. Kamala tries to explain why Carol and Ulysses are wrong, but then Iron Man shows up because Kamala called him too. Captain Marvel immediately decides that perhaps her faith and trust in Kamala were misplaced. Carol leaves after dismissing Kamala and having Becky court-martialed for “overstepping her bounds, not winning the support of the public and for attacking her commanding officer”…which then leads to the police showing up and arresting Becky for “impersonating a law enforcement officer and kidnapping”? At what point did she impersonate a law enforcement officer? Was she not fully sanctioned by Captain Marvel and Alpha Flight this whole time? Why do police enforce a court martial? Anyway, Iron Man tries to impart some words of wisdom to Kamala, but mostly he just tells her that change happens. And later at the hospital, after Bruno wakes up, he tells Kamala that he’s done being her sidekick, and he’s going to go away to a super smart school in Wakanda. This was a really, really bad day for Kamala Khan. In terms of general plot, I just didn’t really like this storyline. I’m reading Civil War II and plenty of other tie-ins, but this Cadets concept just never made any sense to me whatsoever, and it still doesn’t. Granted, that doesn’t necessarily ruin the story, but when the nuts and bolts are wobbly, the whole thing is just a little less stable and confident. But at least Basic Becky worked as an antagonist for Ms. Marvel, so at least the story had that going for it. The real heart of the issue and the storyline are, of course, Kamala Khan herself. She’s still an amazing character, and watching her face off against her hero and idol is just a bit heartbreaking. Part of me feels that it could have been even more heartbreaking with a better storyline, but Wilson manages to make it meaningful even with all that Cadet nonsense. And then Bruno’s news is also pretty devastating. 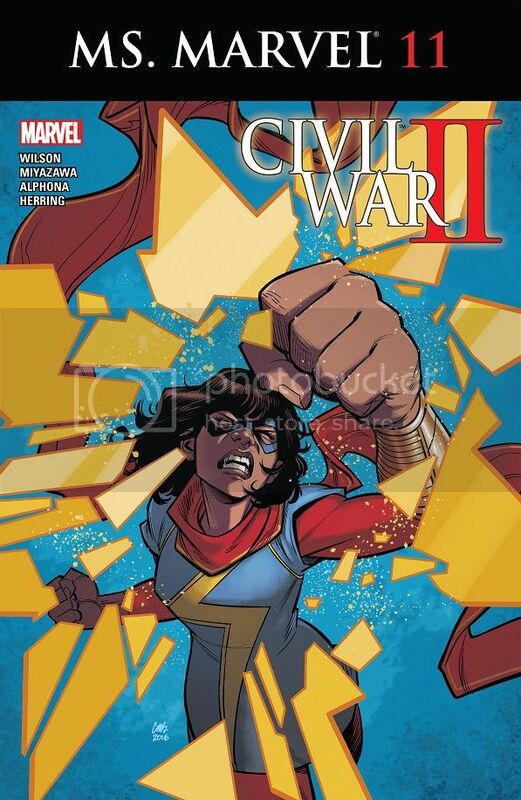 I’m looking forward to see where the story of Kamala Khan goes from here. G. Willow Wilson is still writing a great comic, but the storyline she picked out for the Civil War II tie-in was just confusing enough that it unbalanced the truly meaningful emotional drama found within. 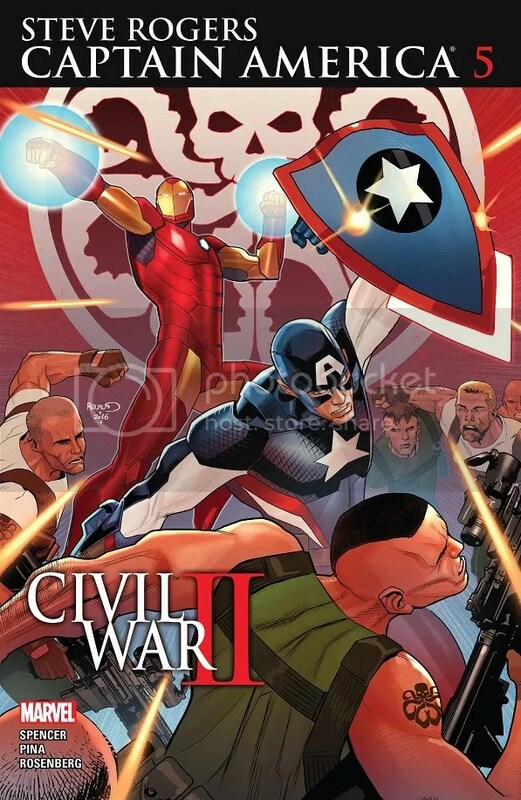 I think this might be my favorite Civil War II tie-in yet. 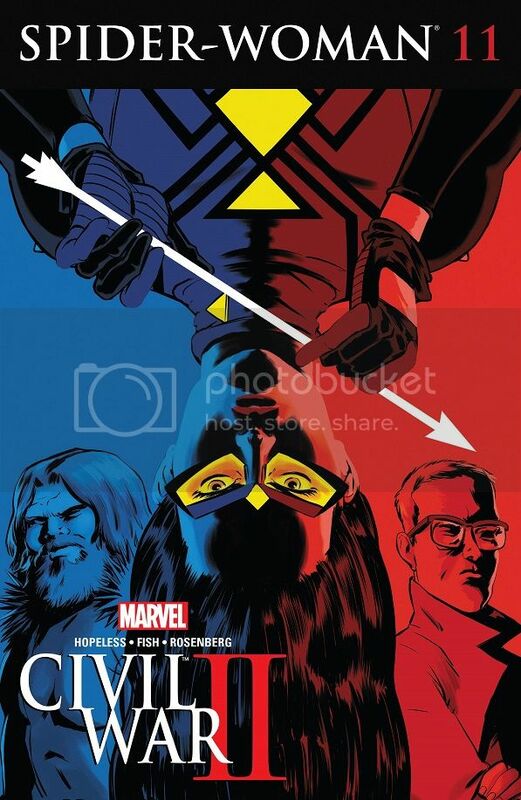 That stupid story has reared its ugly head all over the place these days, but Hopeless really makes it personal for Jessica Drew, and that’s exactly what we want in our comics. Back in the day, Jessica Drew seemed to have a bit of a crush on Bruce Banner and the Hulk, so she is super pissed that he’s been killed by Hawkeye in Civil War II. After first checking up on the body and then heading to Bruce’s lab in search of answers, Jess starts throwing a temper tantrum about how everything is spinning out of control. Porcupine shows up and gives her a good talk to get Jess to go ask Clint Barton directly about what happened — but in order to do that, she’ll need to sneak aboard the Alpha Flight space station. Jess makes it up top easily enough, but Captain Marvel is there and finds her almost immediately. Carol tries to talk to Jess like the friends they are, but Jess is beyond pissed and attacks Carol. Through the scuffle, Carol keeps trying to talk to her friend, but when the dust settles, Jess tells Carol that their friendship is over! This was an emotionally-charged, very personable story that did a great job focusing on Jessica Drew as a person and her own personal feelings about Civil War II. This has largely been a happy-go-lucky comic for a long time, and I’ve enjoyed that, but Hopeless really did a great job delving into Jess’ psyche in this one. I loved it. It helps that he’s done a great job building up the BFFship between Jess and Carol, and how this is a real, legitimate breaking point. Boy, this has been a bad week for Captain Marvel. She’s losing friends and allies left and right. Did Marvel really want to do this to their lead female superhero? Anyway, this was an excellent issue that really got into the main character’s head during this difficult time. Hopeless also used Porcupine well, reminding us all how good a job he’s done building this comic. Civil War II is a mess, but if a writer can make the story this personal for their character, that’s a sign of real skill. I especially enjoyed a flirty flashback between Jess and Bruce Banner. It would be fun to see more flirty Jess in this comic. And the art by Veronica Fish was as top notch as always. This series remains a true gem. So, uh, I don’t know why I haven’t told this story yet; probably because it’s kind of embarrassing. 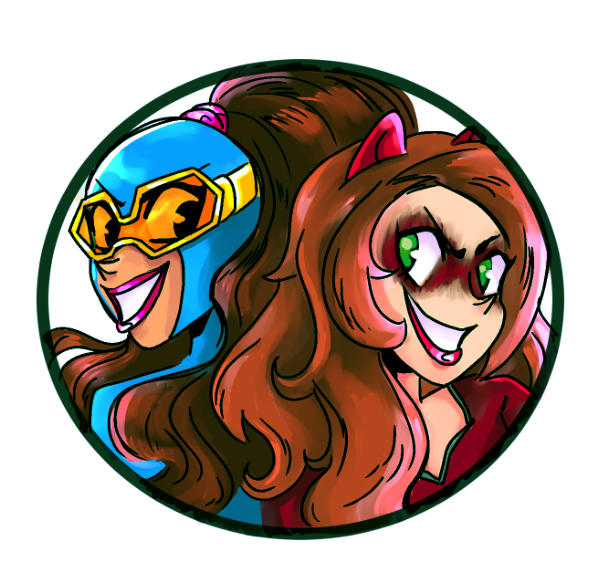 I met Erica Henderson at the Boston Comic-Con last month, and like a fool, I asked her if she was open for commissions to maybe do the cover for my own comic, Gamer Girl & Vixen. Jeez louise, what a fool I was. This was Erica freakin’ Henderson! She doesn’t need some lowly chowder head like me asking her to help out on my self-published comic, no matter how good it is. She remained polite and suggested I use the very convention we were at to find some local, up and coming talent. Smart. Hopefully she won’t remember me when I do make it famous…anyway, on with the issue! While Brain Drain is left in New York to fight crime, Doreen and Nancy head to Canada for a week of camping with Doreen’s mom. But Doreen is bored stiff when they get to the cabin and find out that there’s no electricity or Internet, that they’re really going to rough it (Nancy is pleased as punch, though). Meanwhile, Brain Drain keeps arresting what appears to be the same criminal, and keeps turning him over to police officers and judges who look like the guy too. And then Doreen and Nancy find a whole community of tiny versions of this same guy living under their cabin. Turns out, this is Enigmo, who has the power to split off into multiple versions of himself, and who has been slowly seeding a bunch of duplicates into the world for years now. At the end of the issue, he gets on the news and tells everyone that he has now taken over the world. What can I say, Unbeatable Squirrel Girl is hilarious and amazing. Every new issue is probably the funniest issue of the week, if not the month. It’s been a true gem from the very beginning. This issue kicks off a new storyline with a lot of potential. We’ve got Doreen out of her comfort zone, which is funny. We’ve got some big moments for Nancy, which continues to help flesh out her character. Brain Drain returns for some quality comedy. And we’ve got a freaky new super-villain to mess things up. This is damn fine Squirrel Girling. North and Henderson have not lost their step in any way. They continue to produce hugely entertaining comics, and the new issue is no different. They should be teaching some kind of master class. 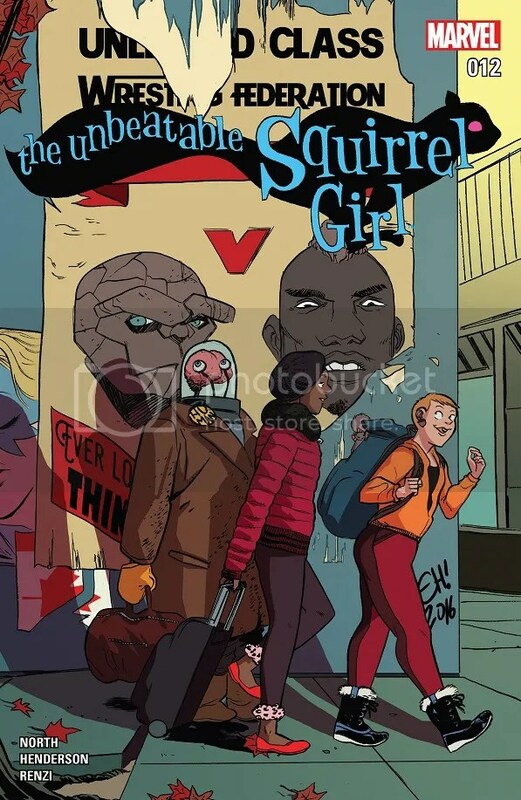 I can’t wait for their original graphic novel, Squirrel Girl Beats Up the Marvel Universe, to come out later this month. Posted on October 1, 2016, in Comics, DC, Marvel, Reviews and tagged Batgirl, Captain America, Captain America - Steve Rogers, Kamala Khan, Ms. Marvel, Spider-Woman, Squirrel Girl, Steve Rogers, Unbeatable Squirrel Girl. Bookmark the permalink. 5 Comments. Captain Steverica is OK. Some interesting stuff, I suppose. Ms. Marvel is really good. The confrontation between Kamala and Carol was rough. And then the Bruno stuff at the end was brutal. Really sad. Poor Kamala. Spider-Woman is great. I loved the callback to KSD’s Avengers Assemble run, and especially Hulk making Spider-Woman a sandwich. That was one of my favourite things ever, because it happened. That run made me want more Jess/Hulk friendship. This issue also did really good work exploring Jessica’s anger. Squirrel Girl is Squirrel Girl. It’s wonderful. Brain Drain is great here. I love his nihilistic monologues. And I feel Doreen’s pain – being out in the middle of nowhere with no Internet is awful. Oh really? That Jess/Bruce stuff had a basis in a previous comic? That sounds fascinating. I never got into that Avengers Assemble run, but if it was as cute as this, maybe I’ll have to track it down. Yeah, the Science Bros arc of Avengers Assemble is definitely something I’d recommend. It’s full of fun banter between the cast, which was Steve, Carol, Tony, Bruce, Jessica and Thor. KSD had two main arcs. There was Science Bros, and there was Inhumanity, which was basically all about the Avengers mentoring Anya Corazon. It was great. Those two arcs are definitely worth reading. Assemble also had a couple Age of Ultron tie-ins written by Al Ewing. Those were incredible and immediately set Ewing as a writer I wanted to watch. Spider Woman was great, well the writing was on the wall since the last issue it’s still sad to see Carol and Jess’s friendship come to an end. I’m sure will be fixed in the future but it still stung especially that last exchange between Captain Marvel and Spider Woman. Ms. Marvel was ok I’ll admit the stuff with Bruno at the end was sad, the confrontation between Kamala Carol felt flat and the scene came off as emotionless to me. That might be becuse I don’t think Willison ever really got a feel Carol’s charcater. I know a lot of people are going say I’m wrong about this but the few interactions that Kamala had with Carol during this series felt forced. Like the writer was trying to make them seem closer than they really are, I don’t if I’m making sense not that it maters it’s just the feeling I got reading this book. Nah man, I definitely think I agree with you on the Carol/Kamala stuff. It’s never been as great a relationship as Wilson has been able to create with other characters, like Kamala and her parents. I wonder if these Big Events are to blame. The Carol/Kamala first meeting was rushed into a Secret Wars tie-in, and now they’re at odds for a rushed Civil War II tie-in.